| Take Your Press Release From Passed-Over to Published! 11 Oct Take Your Press Release From Passed-Over to Published! Let’s be honest here: most standard press releases are never read by the media contact or the prospect you desire to read it. Most releases are submitted on ‘blast’ – distributed in mass form to various outlets of assorted demographics and audience – speaking to, well, no one in particular really. Kind of a Hail Mary pass for generating buzz. 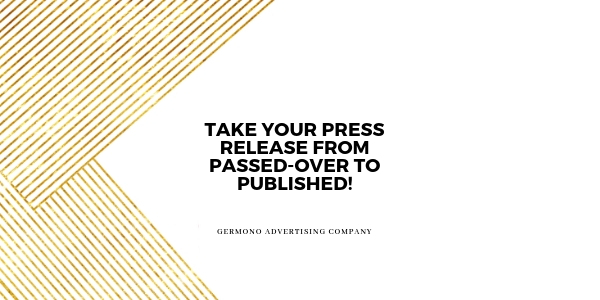 A press release for your business plays two roles: First, it serves as unpaid communication with customers and prospects through an online or print publication. Second, it serves to get your company on the radar of those very same authoritative and reputable publications’ websites and reporters. It’s important to keep these roles in mind as you craft and distribute the release itself. Here are some general tips that are crucial to getting your press release not only read, but featured. 1. Who, What, When, and Where. Should be in a simple paragraph all its own for easy copy and paste into calendars of events. 2. Why. Should be in a separate paragraph – Why is this event taking place, who does it benefit, why should readers care? 3. Ticket/Sign-Up Info. Include website or sign-up link (shortened, easy to get to) if tickets are needed for the event. 4. Interview/Contact Info. Clear contact information should be included (email, phone # and website). 5. Manual upload to calendar. Most media outlets today have resorted to a “self-upload” calendar of events. This means that you or your PR entity should upload all information via “fill out” form themselves to the media organization’s website, if you want it to appear in that publication’s online or print calendar. There are multiple calendars throughout a community (radio, TV, newspaper, community events, city calendars, etc. ), so even though this sounds like a daunting task, it’s critical to do if you want the information out there in the public space. 1. Craft the release in a way it will be “fit for print.” (i.e. write it like a reporter would write it.) Include eye-catching headline, quotes from key players, opening/middle/closing paragraphs. Include appropriate high-res photo or link to a website that allows a reporter to download accompanying art or images. 2. Avoid flowery, descriptive language in relation to your event, product or newsworthy announcement. Reporters/editors will either delete the language or pass over the press release in general because of it. 3. Present the news angle. What segment of the media entity’s audience would be reached? What problem/solution is your business presenting to that particular audience? 4. Include your availability for interviews. Some reporters will be on deadline and have room for one quote only. You want to be available for that interview. 5. Be topical and timely. Why is this relevant to talk about now? What’s going on in the world/region/locality that should make this a hot topic? 6. Don’t overwhelm the reporter/media contact with lengthy introductory email. Have your intro be short, direct and to the point. Why should they want to talk to you in more detail about this topic? Offer to provide resources on a regular basis for a particular subject that you/your business is an expert on. 7. Include a link to an enhanced media opportunity. This includes downloadable photos, quotes from key players, video reel, and demo reel. Don’t let your press release go to waste. Press releases, even on your own site, have huge potential to continue working for you long after your breaking news or event has passed. 1. Include “SEO” keywords throughout your headline. Example: “New Military Entrepreneur Podcast Launched in Norfolk, VA by Local Military Spouse.” All the keywords about who and where this is relevant are right there in the headline. Do the same in the body copy. 2. Include “SEO” keywords throughout your body copy. This is your chance to make your press release more likely to be picked up by search engines – regardless of if you’ve popped on a local media outlet. Include geography, key tags (e.g. “military spouse” or “young professional networking” or “GPS technology”), and up to date company background in the body copy of your release. Another tip: include key partners or supporting experts for alignment within the release for additional buzz on their own platforms. 3. Include all press releases on your own website and social networks. Release employee updates, events, new product launches, new territories, mergers, etc. Identifying what niche publications these could work for publicly (e.g. trade magazine, local business news, etc. ), and remember to release them on your own site and social networks. 2. Make friends with your “most wanted” media contacts. Which media contacts/beat reporters would give your company the best coverage and best access to your desired audience? Reach out to them personally, reference their previous coverage and how this relates/takes a different angle to their coverage. 3. When someone covers you, thank them personally. Print space is hard to come by. For that matter, so is online. So if a media outlet, blog, etc. covers you in that space – thank them online (if on social media), as well as with a personal handwritten thank you note/gift. They will remember this in the future.